Stretching: Your foot is an arch supported by several ligaments, including the plantar fascia. By stretching it out, it is loosened and strengthened. A good exercise is to sit on the floor with your legs forward and knees straight. 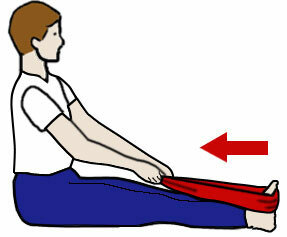 Wrap a towel around the ball of your foot, and pull back for 30 seconds, and then repeat for another 30 seconds. This will not only stretch your plantar fascia, but also your calf muscles and Achilles tendon. This muscle group actually wraps around the heel bone and is continuous with the plantar fascia, so by stretching this muscle, you will relieve plantar fascia pain! “ABC”…Draw the alphabet with your toes: On the bottom of your foot are 4 layers of tiny muscles, which contribute to stabilizing the foot when you walk. By making fine movements with your toes, you will strengthen these muscles that help support the arch, so the plantar fascia won’t need to do so much work. Toe crunches: Just like drawing the alphabet, this also will strengthen the small muscles of the foot that underlie the plantar fascia. These exercises can be done before going to bed at night or when you wake up in the morning. If all goes well, the exercises should minimize your pain. However, Dr. Vimal Reddy warns that not all heel pain is plantar fasciitis. Furthermore, it can be a symptom of a bigger problem. If your pain does not improve or gets worse after two weeks, request an appointment with Dr. Reddy at the First Coast Foot & Ankle Clinic in Jacksonville, FL to see if a more advanced treatment will help.